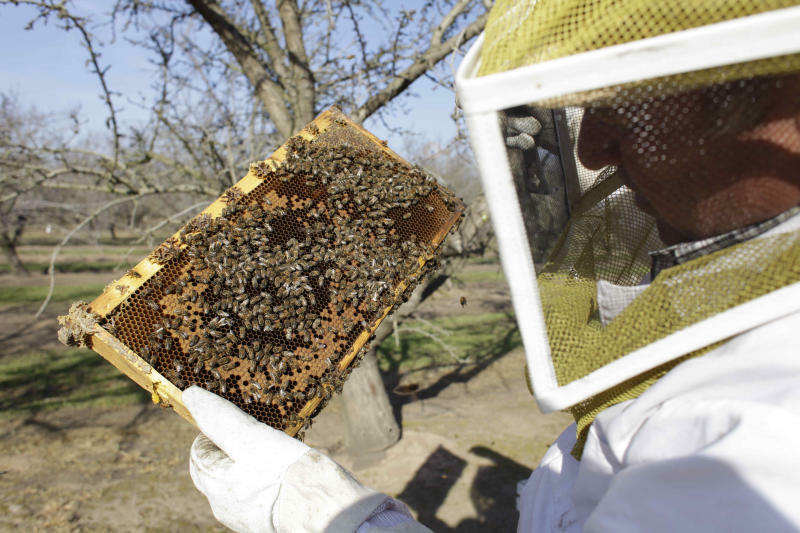 TURLOCK, Calif. (AP) — In an almond orchard in California's Central Valley, bee inspector Neil Trent pried open a buzzing hive and pulled out a frame to see if it was at least two-thirds covered with bees. Trent has hopped from orchard to orchard this month, making sure enough bees were in each hive provided by beekeepers. Not enough bees covering a frame indicates an unhealthy hive — and fewer working bees to pollinate the almond bloom, which starts next week across hundreds of thousands of acres stretching from Red Bluff to Bakersfield. "The bloom will come and go quickly," said Trent, who works for the Bakersfield-based bee broker Scientific Ag Co. "The question is: Will the almond seeds get set? It depends if you have enough of a workforce of bees." That has growers concerned as nomadic beekeepers from across the country converge on the state with their semi-trucks, delivering billions of bees to the orchards for the annual pollination. Most almond trees depend on bees to transfer pollen from the flower of one tree variety to the flower of another variety before fertilization, which leads to the development of seeds. It's a daunting task: California's orchards provide about 80 percent of the global almond supply. And with almond acreage increasing steadily in recent years, the bees must now pollinate 760,000 acres of trees. The number of bees needed is expected to increase as almond demand grows and orchards continue to expand. Already, more than half of the country's honeybees are brought to California at the end of February for almond pollination, which requires about 1.5 million hives from out of state, and another 500,000 from elsewhere in the state. Honeybees are preferred for commercial-scale pollination, because they are social, build larger colonies than other bees, and their hives can easily be moved. 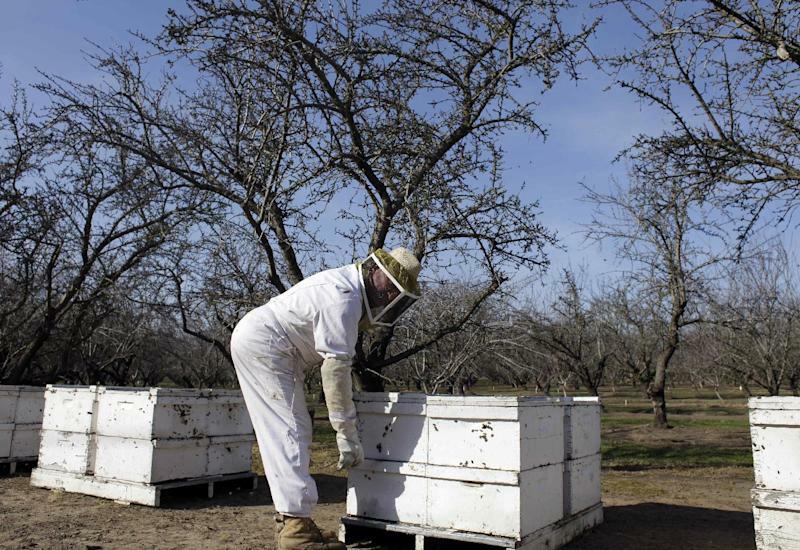 Bee brokers, beekeepers and almond growers around the state say there's a shortage of healthy honeybees for this year's pollination, especially after colony collapse disorder took a higher toll this winter. The disorder, in which honey bees suddenly disappear or die, wipes out thousands of colonies each year. The shortage has some growers scrambling for bees — even sub-performers — as trees are about to bloom, driving up bee prices again this year, to an all-time high of more than $200 per colony. "There's definitely a shortage of strong bee colonies," said Joe Traynor, owner of Scientific Ag, which connects growers with beekeepers. "There is a problem covering all the acres of almonds in the state." 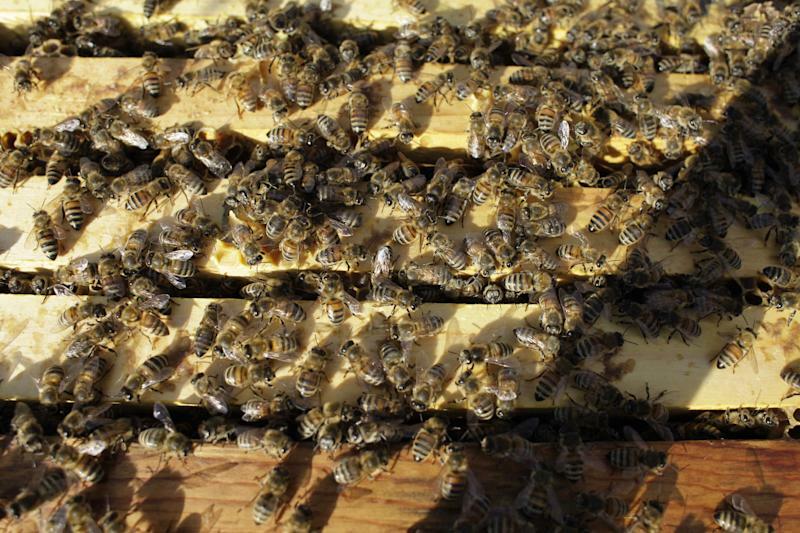 This year, experts say, the die-off has been as high as 40 to 50 percent for some beekeepers. "We have smaller populations in the hives and higher winter losses," said Eric Mussen, a bee specialist at the entomology department of University of California, Davis. "Bees across the country are not in as good a shape as last year. When you stress them far enough, the bees just give in." This year, Mussen said, many bees did not get enough nutrition because a Midwest drought reduced forage. Conversion of pasture land to corn production for ethanol also reduced the number of flowers producing nectar. To compensate for forage loss, beekeepers fed bees more high-fructose corn syrup and other supplements. But such substitutes don't provide all the nutrients pollen does, Mussen said. Malnourished bees are more susceptible to diseases. Lance Sundberg, a beekeeper who hauled his hives for almond pollination from Columbus, Mont., lost 40 percent of his bees this winter due to the drought and mite problems. "You have to buy bees elsewhere to pick up your losses, and not everything we have remaining after the loss is very strong," said Sundberg. "I had a tough time fulfilling my obligations to all the growers." But at least he still has bees, Sundberg said. Some colleagues were not as lucky: they lost 75 percent or even 99 percent. Traynor, the bee broker, said he's been fielding phone calls from desperate beekeepers and growers who are short several thousand colonies — but he has no more good bees to offer them. The shortage will only get worse in the future, he said, as almond acreage grows. Having strong hives is critical, Traynor said, especially during rainy seasons, because bees have a short period of flight time when it's dry enough to pollinate. Fewer bees may not be able to reach all the blooms in time. In recent years, the Almond Board of California, which represents more than 6,000 growers, has poured $1.4 million into bee health research. The group also worked on alternatives to reduce growers' reliance on honeybees, said Bob Curtis, associate director of agricultural affairs. One is the so-called "self-compatible" almond tree, which can set nuts using pollen transferred among its own flowers, thereby needing fewer bees. The group also is urging growers to plant forage to help sustain bees before and after almond pollination. And it's exploring using blue orchard bees, which are solitary bees that do not live in hives but nest in small cavities, to augment the honeybee workforce. But building up those alternatives will take time. "It's tenuous right now," Curtis said. "We've got fewer bees. And if something goes wrong with the weather, some growers could be in trouble."